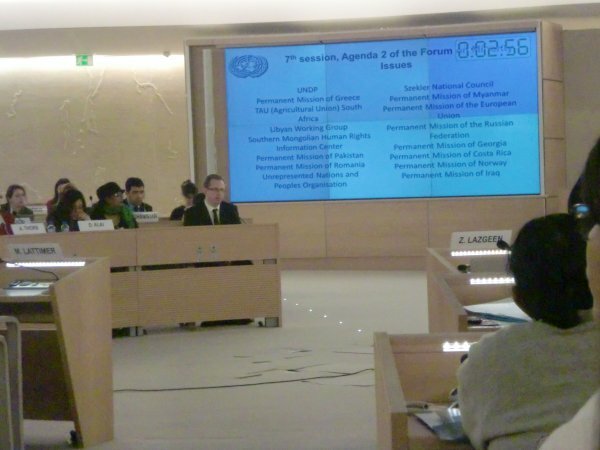 Several UNPO members (including Rehoboth Basters, Ogaden and Afrikaners) participated at the seventh Session of the Forum on Minority Issues held in Geneva, Switzerland, on 25 and 26 November 2014. This year’s forum was entitled “Preventing and addressing violence and atrocity crimes targeted against minorities”. The Forum opened with a statement by the President of the Human Rights Council, followed by a video statement by the Deputy Secretary-General of the United Nations, Mr Jan Eliasson, who underlined the importance for the international community to draw lessons from the terrible and atrocious violence that various minorities around the world currently face, to avoid them being repeated anytime soon. The forum was also opened through a statement by the United Nations High Commissioners for Human Rights, Mr Zeid Ra’ad Al Hussein, a video message by the Special Rapporteur on Minority Issues, Ms Rita Izsak, and final remarks from the Chair of the Forum on Minority Issues, Mr Patrick Thornberry. The first session of the day started with an overview of existing international and regional standards and principles relevant to the protection of persons belonging to minorities from violence and atrocity crimes. Participants debated how to ensure that international and regional standards relevant to the protection of minorities from violence are reflected in national legislation, policies and practices. The afternoon session focused on understanding the root causes of violence and atrocity crimes. Following the statements of keynote speakers, challenges and rights violations experienced by minorities leading to violence had been discussed and it was considered how patterns of discrimination against a particular minority in the political, social, economic and cultural spheres can translate into abuse and systematic violation of basic human rights and can escalate into atrocity crimes. African Rights Monitor spoke under this agenda item about the Ogaden. Ethiopia is the living proof that good laws are not everything: despite the fact that the Constitution explicitly recognises the right to self-determination, this is, according to ARM, just dead letter. Also, the Afrikaners shared their concern for the continuous cruel and violent atrocities committed with brutal force against the South African farming community. The last session of the day was dedicated to the topic “Improving prevention of violence and atrocity crimes”. Therefore, participants and speakers considered existing risk assessment methodologies and early warning mechanisms, existing gaps and possible measures to improve existing approaches, channels of communication and information exchange at national, regional and international levels to act effectively to prevent violence at an early stage. The morning session of the second day the forum focused on how to deal with a conflict after it has started. The speakers looked at measures for the resolution or mitigation of its consequences, looking in particular at the role of all stakeholders in finding and implementing rapid, tailored response measures to protect minorities under attack and to deal with specific humanitarian concerns affecting them. Once again, participants had the opportunity to share their experiences in situations of this kind. In the break between the two sessions, UNPO organised a side-event on “Preventing and Addressing Violence and Atrocity Crimes Targeted against Minorities: the Situation of Unrepresented Nations and Peoples”, which aimed to draw attention to the violent crimes endured by different minority groups, including several of its members, who lack proper representation. For more information on the side-event, please see here. The afternoon session was dedicated to the aftermath of a conflict: how to avoid renewed violence, while trying to build a solid and long-lasting peace which respects the diversity of the various communities. The session looked into some tools useful for this purpose, such as transitional justice mechanisms, the accountability of those responsible for crimes against minorities and the importance of memory. During this session, representatives from the Acheh community recommended that the UN, in compliance with its procedures and mechanisms, independently examine incidents of violence and accountability for atrocity crimes, in particular in Indonesia. All Members' statements will be available for download from the right column.